This indicates the pavement condition for this treatment. Similar to healthy living, taking preventative measures is of the upmost importance for the longevity of roadways. One of the most common pavement preservation methods is a slurry seal, which is a mixture of asphalt emulsion, aggregate, mineral filler, water and other additives accurately proportioned, mixed and uniformly spread over a properly prepared surface. 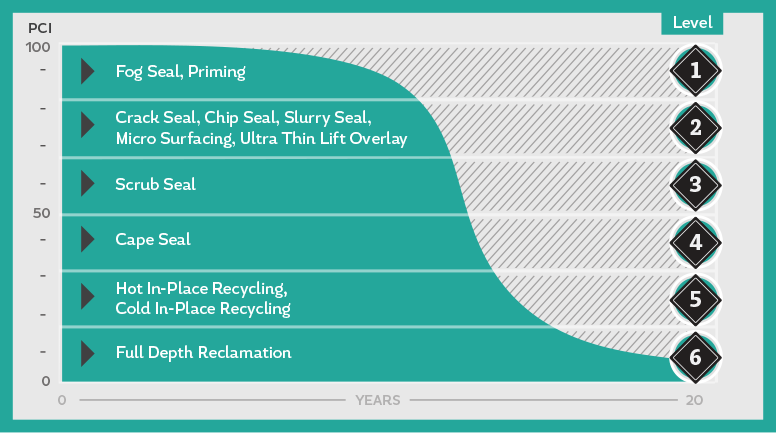 At an average cost of $2.50 per square yard, slurry seals allow for a life extension of roughly 5-7 years for a quarter to a third of the cost of major road reconstruction. In addition, the seal prevents moisture and air intrusion in the pavement and improves skid resistance. Slurry seals are most often used on state highways, rural roads, county roads and even airport runways due to their high friction coefficient. Slurry seals are not recommended where ruts are greater than ⅜” or unsealed cracks of a ¼” are present. Slurry seals are less expensive, more convenient for travelers, require less time and are also eco-friendly. According to a study performed by BASF Corporation on the environmental impact of slurry seals, they are less harmful than other methods like hot asphalt mix. Use a prepared mix design. Clean pavement prior to applying seal. Patch and level as needed. Seal cracks ¼” or greater. Calibrate mix paver to ensure proper mix. Ensure the mix consistency is neither too dry nor contains excessive liquid. Control traffic until sufficiently cured. Please click the button below to download detailed construction specifications for this treatment. The Pavement Condition Index (PCI) helps identify the treatments best suited to extend a road's life. The chart above shows the corresponding treatment types suited for roads at each stage of pavement degradation over 20 years. Each stage is categorized with a Pavement Condition Index.